UPTE-CWA Local 9119 members marched into a bargaining session at UCLA on June 21 to give management thousands of signatures on petitions from their coworkers demanding protection for quality jobs, research, health care and education. They represent some 10,000 research and technical workers at the heart of the University of California’s far-flung 10-campus, 5-medical center system who recently began a new round of contract bargaining. Outside of the UCLA bargaining location, union members at the other UC locations showed their support “virtually” by gathering with signs and stickers and flooding their support for their bargaining team on to social media all day. “We’re launching our campaign under the banner #UPTEStrong,” said Kelsey Springer, and UPTE-CWA member and lab assistant at UC Berkeley, who said union members see solidarity as the key to winning improvements at the bargaining table. UPTE-CWA members are committed to action on a sound pension plan, livable wages, job security, and stopping UC’s ability to outsourcing jobs overseas. The university recently contracted out nearly 100 UCSF information technology (IT) jobs to an India-based company, forcing long-time employees to train their own replacements before they were laid off, all for a plan that didn’t live up to its money-saving goals and exploited foreign workers as well. Other issues on the table include compensation, hours worked, sick leave, parking fees, benefits and health and safety. UPTE-CWA’s two largest units, 4,000 researchers and 4,000 technical employees are jointly bargaining. The units include titles such as staff research associates, lab assistants, animal technicians, electronics technicians, and scene technicians. 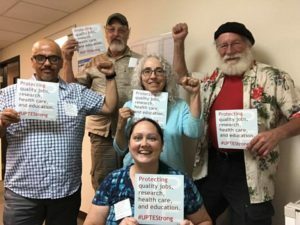 UPTE-CWA members in a third unit comprised of 2,000 health care professionals, including clinical lab scientists, social workers and dieticians, are working to align their contract language with the other two units for greater collective power in the workplace. In a recent bargaining session, union members from UC Davis’ Mondavi Center for the Performing Arts spoke about working 16-18 hour shifts without overtime and highlighted why supposedly “limited” appointment jobs without benefits were abusive. Across all UC campuses and medical centers, those appointments now outnumber career jobs with benefits by a 3 to 1 ratio. Union members also told management’s bargainers about outdated machinery and unsafe hazardous working conditions in UC’s labs, such as non-functioning eye wash sinks and asbestos contamination. Union members are demanding that UC engage in fair bargaining and transparency, citing a recent scathing state audit that uncovered $175 million in secret funds and added fuel to a legislative effort to take control of UC’s budget. Also in the press are lavish dinners and parties that the regents threw at UC expense – the last one coincided with a vote to increase student tuition. At last month’s bargaining session with UC management, UPTE-CWA was joined by UAW (representing student workers and postdocs), AFT (representing lecturers and librarians), and student organization representatives in a show of solidarity for livable wages and the creation of sanctuary campuses to preserve UC’s diversity and openness. UPTE-CWA asked the university to join it in opposing the current political environment, which activists said undermine the foundations of academia and freedom of expression. UPTE-CWA 9119 represents thousands of professional and technical employees systemwide at the University of California, as well as skilled trades workers at Livermore National Laboratory, and associate faculty at 3 California community colleges. Learn more at www.upte.org. Max Belasco and Pavel Krylov are members of UPTE-CWA. Max works as a programmer analyst at UCLA, and Pavel is a UC Davis dietician. Jelger Kalmijn is UPTE-CWA’s systemwide president and a UCSD researcher.